Our new range of standard size base and wall units have been developed for our customers to have the flexibility to design their own dream kitchen. All of the doors and frames are made out of solid tulipwood, the doors are constructed using traditional mortice and tenon joints. As standard, all drawers feature dovetailed joints and are on soft close drawer runners. Each units is fitted with adjustable feet allowing for a customised fit. These handmade kitchen units are hand painted using The Little Greene Paint Collection ensuring you can achieve your desired look. 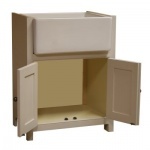 Our Handmade Fitted Kitchen Range offers a variety of base, wall and appliance units. Personalise your kitchen with a large selection of knobs and handles, wood and granite worktops. We hope that the introduction of this range of kitchen units will allow customers to create their dream kitchen. These fitted units also can be complimented with our range of freestanding kitchen units. Please feel free to contact our sales office to discuss your ideas and a no obligation quote. Visit our newly fitted display kitchen at our North Yorkshire showroom.